Reader Lexi has a great question about using materials that were copyrighted, but might not still be copyright-protected today. Her particular reason for asking the question is that she teaches art to children, has a book of children’s poems she’d like to use in her classes and have the children do artwork to illustrate the poems. And then, she hopes, she can put the artwork and the poems together into a book and sell it as a fundraiser for her school. It’s a great idea — but will it be a copyright problem since the book was published in 1953? If the copyright was not renewed as the law then required, then the copyright on a book published in 1953 would have expired at the end of the 28th year of the initial copyright protection term5 or 31 December 1981. But if the copyright was renewed in that 28th year, the total copyright term for the work is 95 years (28 years plus 67 years), and the work will be copyright-protected until 31 December 2048. 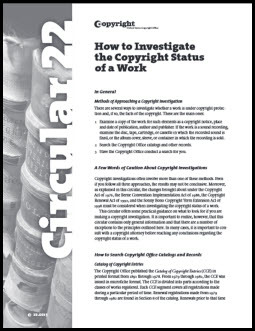 So… how do you know if a copyright was renewed or not? While the question here is focused on poetry, it’s a question we often encounter as genealogists when we try to figure out if we can use material created by others as part of our own publications — our genealogy society journals, our family histories, even blogs like this one. And there are at least four options for getting an answer. Third, you can check for online versions of the CCE. One major collection is at Internet Archive, with 674 entries (some of which, of course, are duplicates), and another is on The Online Books Page from the University of Pennsylvania, with most if not all of the digitized records of both registrations and renewals accessible from one entry portal. And finally you can check the searchable database prepared by Stanford University from the Project Gutenberg transcriptions and other records. The big advantage to this database is that it only includes renewals. All of the online records, of course, have the potential for error. Stanford, for example, reported that its error rate was “less than 1%,” but cautioned that “in practice there is significant opportunity for user error or other problems in searching.”12 Using all of the online methods, however, should reduce the chances for making a mistake and, if the stakes are high enough, paying the Copyright Office for a search to be sure is the way to go. Can we check with the publisher? Or the author? If you can find the author and/or the publisher is still in business, sure! Helpful summary. If nothing in a book indicates that it was ever copyrighted, how early does it have to be printed for there to be no concern at all about copyright protection? There is what looks like an official stamp on the first page of the first part saying “Library of Congress City of Washington” with 1870. I suspect that is the date LOC received the copy he sent to them. The other two parts are such dark copies that I can’t tell if the LOC imprint is there. My questions are whether or not the lack of a visible printed copyright, or the age of the book, means this book is out of copyright? What uses of the contents can I make? Sending the book to the Library of Congress was most likely to comply with the deposit requirement, so for purposes of copyright protection. But… most importantly, anything published in the United States before 1923 is now out of copyright. So you can make whatever uses you’d like of this book. So his sending it to LOC means that he did copyright it, though it’s not marked as such? I do understand that the early date means it’s now out of copyright and the family can use it as we wish. Without checking the registrations, I couldn’t be sure, but deposit with the Library of Congress was a part of the registration process so at least it suggests that he tried to copyright it. This is a book of poetry. What is the copyright status on the individual poems? The original publisher might have gotten rights to reprint the poems in this volume and to re-print this particular volume, but what happened when the book was declared out of print? And in any case, did the authors retain the rights to have the poems published elsewhere? Do those rights pass to the poet’s estate after the poet is deceased? A collection could have merely a compilation copyright, true, in which case there could be two levels of protection: one for the publisher and one for the individual poet. If each poet only gave permission for the poem to be published, however, rather than transferring all rights to the publisher, then the poet should have secured an independent copyright which would still have had to be renewed within the statutory time period. I am just now going back through my 2500 name genealogy database and adding source information. I have 30 years of random source documentation saved in ten binders and scanned but I did not regularly reference the material in my database software. (Mistakes of an amateur). The copyright mine field makes me hesitate to include scanned images of the documents as part of the source information but the source reference description appears very sterile compared to the actual images. My documentation includes a multitude of original Birth and baptism certificates dating as far back as the 1880’s, Original Grave plot contracts from the same vintage, Newspaper clippings and reprints pre and post 1923, as well as certificates I have ordered from various state vital record sources and the GRO in the UK. The ancestry sourced facts with the referenced actual media links look so much more complete. Only a small percentage of my original source material actually has the DO NOT Copy shown on the documents. Some of the early 20th century genealogy books can be found online in multiple places and it is hard to know what has been duplicated legally with no copy write and what has been bootlegged. I could use the generic pre-1923 is OK but it is easier to just not include any scanned images in the database and continue to share my binders with anybody who feigns an interest.